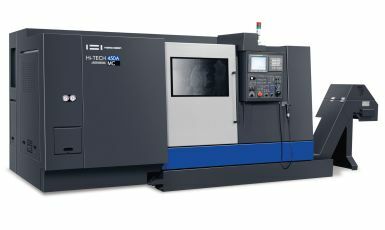 The Hwacheon Hi-TECH 450 turning center with its small footprint provides space efficiency, while offering the largest turning diameter in its class of mid-size lathes at 500mm as well as turning length of 1350 mm. The Hi-TECH range of six machine configurations offers a great deal of versatility for high speed or high torque operation. A high-powered spindle with integral motor offers a low-speed of 800 rpm for high-torque turning and maximum speed of 3,500rpm with a rapid feed rate of 20/24m/min (X/Z). Turret indexing time to adjacent tools is only 0.25sec. Turret capacity is 12 tools. Hi-TECH 450 has an integrated 45-degree angle bed frame to minimize heat distortion and promote chip-shedding and work area access. The had-scraped wide guide surface and the unique bed design absorb the vibration sufficiently, to ensure high degree of stability during hard turning. All guide surfaces are rectangular and incorporate tack guide to maintain rigidity and accuracy in prolonged operation. The geared transmission system permits high-torque turning at low speed and also high-speed turning. The transmission is separate from the spindle motor avoiding the effects of transmission heat and the vibration on the spindle. Hi-TECH450 has an optional Y axis which can be easily added to MC/SMC type of the Hi-TECH 450, reducing cycle times for multi-function operation.